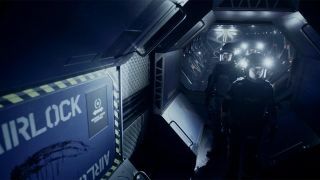 Rocinante crewmembers get closer to understanding the conspiracy they're embroiled in over the course of "The Expanse," Season 1's final episodes. Hey, space fans! Tune in tonight for the action-packed two-hour finale of "The Expanse," which airs at 10 p.m. EST on Syfy. Over the course of the season, the Syfy space adventure has built up a complicated web of mystery, politics and loyalties spread across the future solar system. Tonight, the show promises to shed light on some of the series' fundamental questions in the season's final hours — and give the characters we've grown attached to plenty to do. To quote Syfy's episode description (beware of spoilers, if you haven't watched episode 8! ): "With Holden and Miller uneasy allies, the truth behind Julie Mao's disappearance is revealed." The series is based on a set of five books (so far) by James S. A. Corey, a pseudonym for authors Dan Abraham and Ty Franck (see Space.com's interviews with the authors about the writing process and their work on the show). And if you're desperate to know more after tonight's finale, don't worry — the show was recently renewed for a second, 13-episode season next year.